One of the suspects arrested for the murder of a former winner of Gulder Ultimate Search, Hector Jobarteh, has owned up to his involvement in the crime. The suspect, 49-year-old Ismaila Adeyemi, said he got a mobile phone from the valuables carted away from the victim’s residence. 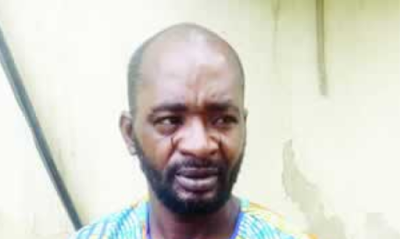 He said his brother, Usman Adeyemi, who had also been arrested, helped him to sell the phone for N7,000, adding that he gave Usman N2,000 from the sum. Punch Metro had reported that some assailants had, on September 3, 2017, trailed 38-year-old Jobarteh to his house on Olufowora Close, New Oko-Oba, Agege, from the Murtala Muhammed International Airport, Ikeja, and shot him dead. It was said the deceased had gone to pick his younger brother, who arrived from abroad, at the airport. Apart from Ismaila and Usman, four other suspects, including an Uber driver, who took the gang to the victim’s house, and the buyers of the phone, had been apprehended. Ismaila, who was paraded on Monday at the Lagos State Police Command headquarters in Ikeja, told our correspondent that one Nonso, KK and him stormed the house that Jobarteh’s lived on a robbery mission that day. The father of two children explained that a lady, who is still at large, led them to the residence, adding that the deceased’s father was shot in the attack. He said, “I knew KK through Nonso, whom I worked with in a filling station in Apapa some years back. I met Nonso about five months ago and I gave him the address of where I live in Sango, Ogun State. KK just came back from abroad that time. “I did not know who the man was before the operation. On that day, we parked at a filling station around his house and a lady came to meet KK. After a while, he received a call from the lady and we saw the man (Jobarteh) drove into the close. “We followed him, but did not know where he entered. KK approached a woman and lied to her that the man’s car hit his and he sped off. He begged her to direct us to where the man entered and she did. When we got into the building, we saw the car and met another lady on the premises. The native of Osogbo, Osun State said the gunshot prompted Jobarteh to come out from a room to the living room, where KK immediately gunned him down. “I did not shoot at all, although I was holding a gun too. I quarrelled with KK for shooting them, because our plan was just to rob. He threatened to shoot me and I kept quiet. It was a pair of shoes and flowers that were in the bag we collected from him. We didn’t find money there. “I took away only his white handset while KK went with the bag. I gave the phone to my brother, Usman, to help me sell it. He said he sold it for N7,000. I collected N5,000 and gave him N2,000,” he added. However, the state Commissioner of Police, Edgar Imohimi, who paraded Adeyemi, said he shot the GUS winner. He added that the command would not stop until other suspects involved in the murder were arrested. Imohimi said, “I am glad to announce to you that after weeks of extensive manhunt, the principal suspect, Ismail Adeyemi, who pulled the trigger that killed the victim, has been arrested and he confessed to the crime.